So is Peckham the new Hackney? Well, if Bold Tendencies is anything to go by, then it’s definitely looking in the right direction. Founded in 2007 by the Hannah Barry Gallery it has become an institution in itself; an essential summer-time destination complete with Frank’s Café and Campari Bar. 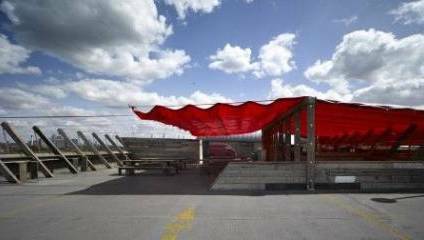 Bold Tendencies is a sculpture park held in a disused multi-storey car park in Peckham. With visitor numbers reaching 30,000 in 2009, this ambitious but successful project has been committed to supporting and showcasing new art by international artists. Bold Tendencies brings free art to a part of London too readily neglected by the art world. Being situated south of the river, approximately 6 miles from the buzz of East London’s arty Hackney, this project is still pulling in the crowds. And what better venue could be chosen for The Place’s presentation of the best bite-sized dance pieces of the last 12 months, in a one off event being held on Saturday 24th September. Tickets are free and it promises to be a fantastic showpiece in this exciting venue. Lost Dog will be appearing with their most recent work It Needs Horses; the duet’s piece features a down-at-heel ringmaster, his glamorous bedraggled assistant and their increasingly extreme measures to get a crowd. Other performers include Darren Ellis, Protein, Freddie Opoku-Addaie and Frauke Requardt, and finally, the Avant Garde Youth Company. As the winners of The Place Prize 2011, Lost Dog at Bold Tendencies makes a great combination for an interesting night out. So head down, kick back with a cocktail from Frank’s and enjoy some eclectic dance at one of London’s coolest rooftop venues.